With a nod to Simon Sinek’s Golden Circle, it’s important to know WHY we are gamifying a program or process before we begin to actually gamify it. If I could anticipate what he would say (at least a few years ago) about the WHY of gamification, I believe Sinek would say our WHY will determine HOW we will gamify the learning program which will determine WHAT game elements and mechanics we will apply to our program. I’m sure the idea that there are four types of gamification didn’t originate in my brain, but I’ve given some thought to the below categories recently, and I’d like to begin a discussion and an awareness when we engage in the gamification of learning. Also, these types are not separate and distinctive; there are grey areas in between. So be kind and generous in your replies (and let me know whom I should be attributing to below categories to). As a Cosmetic: Here you simply add game elements, visuals, and other design elements to liven up a program. Think of a map that learners travel along as they continue through the program. The program will feel different from a traditional learning program, but really, only the cosmetics have changed; the delivery of the information differs little beyond the cosmetic “shell” of gamification. As an Accessory: This is where we slip in the old Points, Badges, and Leaderboards. The learning follows a traditional path, only now we have a way of marking progress and rewarding certain behaviors or activities. There is more involved than a visual shell over the training, but in reality, the program itself has changed little beyond some sort of economy or method for charting progress. 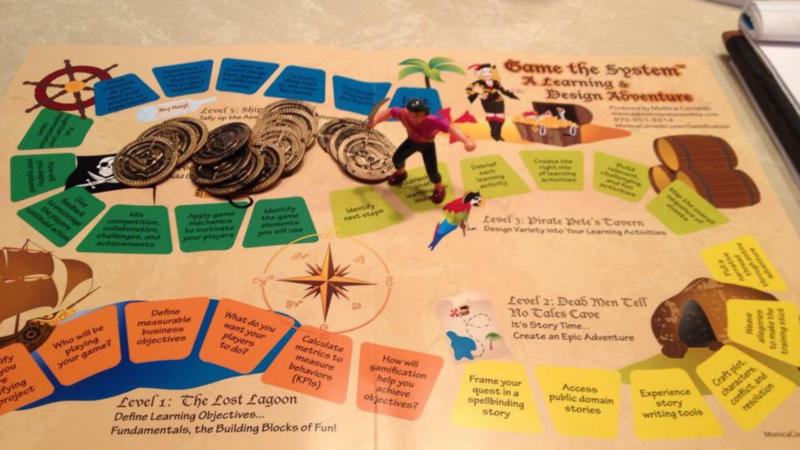 Integrated: Here is where gamification becomes core to the learning experience. Elements and dynamics are subtle and deeply integrated into the learning program. Learners walk through the Magic Circle and become immersed in a new environment. There is no separation between the game mechanics and the learning process. Raison d'être: This is when the entire program is a game. There is no subtly or nuance. Learning becomes a byproduct of the game. Learners are aware that they are playing a game and are only aware of learning when debriefed or tested. Some would argue that this not actually gamification, but a serious game instead. Of course, it is easy to have a cosmetic overlay for a program, and it takes only a little effort to slap on some points and have learners level up between modules. On the other side, Type 4 has a cost for the designer and learner. From the designer’s perspective, their concentration must be on the game first and learning secondarily. From the learner’s side, they can only concentrate on so many games at a time. If every training is a game, they will become confused over which lessons were associated with which game. In this environment, the safest and most effective type of gamification is Type 3. Here, themes and mechanics support the learning, not dress it up or distract from it. If done properly, the learner may not even be aware of the game mechanics nor how the mechanics engage them in their own learning. When you look at your gamified programs, where do they fit among these four types? Are there types of programs where Type 1 and 2 are sufficient? Do you Type 4 learning programs in your catalog? Can you envision a fully integrated gamified training? We'll let you know when we post a new article. Don't worry, your information will not be shared. We like our community too much.